Identity Crisis: Do Immigration Judges Need More Freedom? W hen Ashley Tabbador steps into an immigration hearing, she wears a black robe and is addressed as “Your honor.” She weighs arguments from the parties before her to decide cases on behalf of the U.S. government, and her rulings are legally binding. But that, in many ways, is where the parallels between immigration judges and other judges end. Tabbador, like the roughly 400 other immigration judges across the country, is not part of the judicial branch. She reports to the U.S. Department of Justice. Her decisions can be overturned by the U.S. Attorney General. She is bound not just by precedent, but also by agency policy. “We don’t have control of even our dockets. A lot of traditional, basic logistical authorities judges exercise in controlling their [court] we don’t have,” said Tabbador, who is head of the National Association of Immigration Judges. But there is a growing movement to change that. Increasingly, immigration judges, legislators and other advocates are calling on Congress to shield immigration courts from political influence. A bill introduced in the Senate on March 6 aims to give judges greater independence by protecting them from retaliation for their decisions and removing quotas for processing cases instituted by the Trump administration. But many advocates are pushing lawmakers to go further and remove immigration judges from the DOJ altogether, instead converting them to Article 1 judges. Putting them on equal footing with the rest of the federal judiciary will allow them to fix severe inefficiencies in the immigration court system, they say. It’s not a new proposal. Advocates have been pushing this idea for decades. But sweeping policy changes implemented under the Trump administration, including decades of precedent personally reversed by the president’s first two attorneys general, could add fuel to the movement. T he immigration court system often shifts with the political winds of the White House. Each attorney general can either expand or contract the independence of immigration judges — originally called special inquiry officers — by issuing new regulations or by reversing decisions from the Board of Immigration Appeals, which takes administrative appeals from the lower immigration judges. “In past administrations, you feel something when it goes from one administration to another, say from Clinton to Bush. But I feel there’s never been a sense before of judges being pressured and pushed to the degree that they are now,” said Jeffrey Chase, a former immigration judge and former senior legal adviser at the BIA. 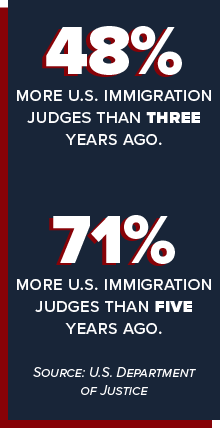 Over the last few decades, federal officials have steadily provided immigration judges with a greater degree of judicial independence, experts say. But when former Attorney General Jeff Sessions personally stepped in over the authority of the BIA to rewrite published decisions — upending years of precedent in the process — many felt it signaled an about-face towards treating judges more like an arm of the DOJ. In the first case, known as Castro-Tum, Sessions stripped immigration judges of their authority to administratively close enforcement cases considered low-priority, such as the deportation of someone waiting for a visa or asylum application to be processed. The ruling also removed immigration judge Stephen Morley for delaying a deportation order. In the second case, known as the Matter of A-B, he essentially eliminated domestic violence as a situation that could qualify someone for asylum. A U.S. district judge placed an injunction on the ruling in December, but it is expected to be appealed. Lawyers and former judges say the A-B case made it harder to approve asylum cases, while Castro-Tum improperly incentivized deportations over allowing for more time on certain asylum or visa cases. 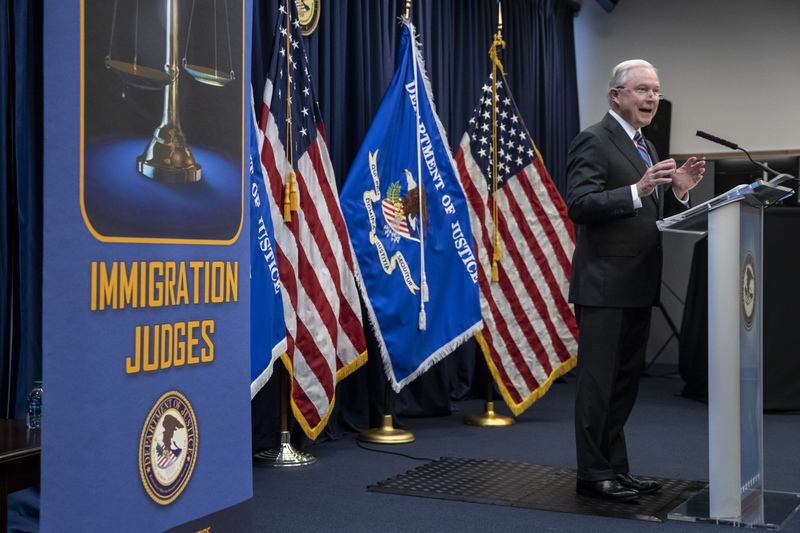 The DOJ has maintained that the cases reestablished important immigration law precedent — and set bright line rules that should help make the immigration court system more efficient. “We have overturned cases that did not meet the standards set out by law — and by doing that, we have taken away some of the incentives to make meritless claims,” former Acting Attorney General Matthew Whitaker, who succeeded Sessions, said in a December 2018 speech. More cases are now moving through the court’s pipeline. In fiscal 2018, the number of decisions on asylum cases grew 40 percent over the previous year to 42,224, including both grants and denials, according to data compiled by the Transaction Records Access Clearinghouse of Syracuse University. A representative for the DOJ did not respond to requests for comment. During his recent confirmation hearing, William Barr — who became attorney general in mid-February — declined to answer direct questions on the Castro-Tum and A-B cases, but affirmed the attorney general’s authority to certify cases to himself. Sessions is far from the first attorney general to take immigration cases into his own hands. During her tenure, Janet Reno decided three cases through certification, while Eric Holder and Loretta Lynch both decided four, Chase noted. Fifteen cases were decided through certification during George W. Bush’s eight years in office. So far, the AG’s office under Trump has certified 10 cases in two years, four of which now fall in Barr’s lap. Andrew Arthur, a former immigration judge and resident fellow in law and policy at the conservative research institute Center for Immigration Studies, said certification can be a more efficient way of clarifying policy issues or fixing erroneous immigration court decisions, especially given the government’s attorneys can’t appeal such decisions. Only those seeking asylum can appeal to a federal court. The Castro-Tum and A-B cases are part of a bigger push and pull between what the DOJ has presented as necessary changes to reestablish the rule of law and bring efficiency back to the immigration court system, and many judges’ claims that they’re being treated as means to a political end. Those judges agree there is a need for greater efficiency. 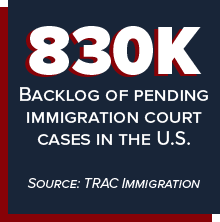 Immigration courts are facing a massive 800,000 case backlog, which grew by 200,000 cases in the recent government shutdown. But some view the administration’s more aggressive approach as part of the problem. “The backlog is growing because we are constantly used as an enforcement tool,” Tabaddor told Law360 in February. The backlog has also long been on the rise because there are too few judges. Arthur, who was a former immigration judge, estimates 700 judges are required to properly deal with the growing caseload. This administration, more than most, has made headway on that problem. On Sept. 26, Sessions welcomed the largest class of immigration judges in EOIR history. Forty-six immigration judges joined DOJ that day, just three weeks after an initial record-breaking class of 44 judges were added. The hiring spree was part of Sessions’ larger plan to put the administrative court system on track to clear the case backlog. Even critics of his administration applauded the move. “They are hiring quite a few, which I have always supported. I always felt to have a fair system of hearing of people, you need fair resources for people — judges, clerks, staff,” said Ur Jaddou, the former chief counsel of U.S. Citizenship and Immigration Services, who left in 2017 with the outgoing administration. On Friday, during the swearing in of 31 newly appointed immigration judges, Deputy Attorney General Rod Rosenstein said the DOJ now oversees the greatest number of immigration judges ever, including 48 percent more judges compared to three years ago and a more than 70 percent increase compared to five years ago. Rosenstein on Friday also stressed judges' roles as DOJ employees and members of the executive branch, according to his prepared remarks. "You follow lawful instructions from the attorney general, and you share a duty to enforce the law," he said. Other policy shifts, including requiring judges to process 700 removal cases a year and making it part of their performance review, have stoked concerns about independence. Some fear the quotas encourage judges — especially new hires — to weigh their own job security against giving extra, sometimes necessary, time to a case. “It’s not the way you’re encouraging judges to make decisions independently,” Jaddou said. On March 6, lawmakers, among them Sen. Mazie Hirono, D-Hawaii, introduced a package of immigration bills that included the Immigration Court Improvement Act of 2019. 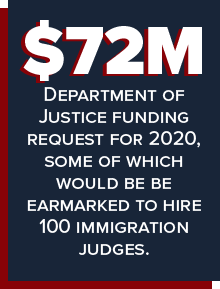 While the bill wouldn’t separate the court from the DOJ, it would take steps to ensure immigration judges can exercise independent decision-making by barring discipline over good-faith legal decisions and creating a transparent judicial complaint process. It would also eliminate quotas as a way to appraise a judge’s performance. As the newly Democrat-controlled House of Representatives places a spotlight on the administration’s immigration policies, there is increasing hope among advocates that a bill to turn immigration courts into an Article 1 court could resurface. Supporters would include the American Bar Association, which has called for an independent immigration court since 1981 and last year asked Congress to again take up the matter. The group argues it would have a positive impact on district courts, which face the burden of appeals from the BIA, because an independent court would inspire greater confidence in immigration rulings. Any such bill, however, would have a hard time passing the Republican-controlled Senate, in part because of the constitutional question as to whether a court not overseen by the executive branch can make decisions tied to the foreign policy and national security powers of the U.S., Arthur said. If lawmakers take a pass on changing the immigration court now, they may only be kicking the can down the road. Trump’s attorneys general may have “exploited” the system’s lack of independence, Tabbador said, but there’s a larger issue that isn’t going away — whether or not Americans want a court of law and its hundreds of judges exposed to the politics of any administration. “Its indefensible to have a court system run like that,” Tabbador said.